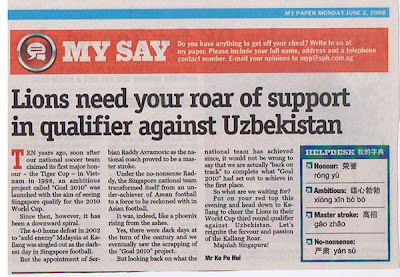 The leading up to and the days that follow after the game against Uzbekistan saw some of my letters being published on the mainstream papers. 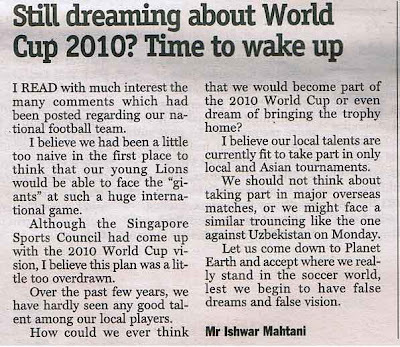 Days later (6th June 2008), another of my letters (below) was published on "TODAY" (dated 6th May). This time round, I voiced my opinion by saying it wasn't fair to "pin-point" the naturalized players only for the defeat. (Unfortunately, the guys at TODAY tweaked my line a little bit and somehow misnterpreted my views.. Sight! ). On the same day on "MyPaper", one honest chap gave his "wake-up" call to we all die-hard supporters (as depicted above). Feeling a lump in my throat, I wrote in again (above, published on 9th June 2008) and "thank him" for his honest view. Writing to the mainstream press can be a daunting task or bluntly saying it is a "waste-your-time" thing to do. Countless time, I wrote to the mainstream press (regarding other issues), hoping to have my views seen and discussed but countless time, my letters were dumped into the basket. If some of you guys are regular followers of these so-called "feedback" pages of the papers, you might noticed one or two "regular writers" (example a Mr Law, a Mr Leong and a guy named after a card of a poker card.) - are these guys' views really struck a chord with the masses that most editors would use them? Although, I'm disappointed with the treatment by the mainstream folks on local football, however at this point of time, they are still essential to get the message across.. SIGHT!! Good work mate. You keep at them and keep your voice heard, the likes of yourself and Jakarta are doing great work on the domestic scene in Singapore. I hope i cna do the same for Thai football from my base in the UK. 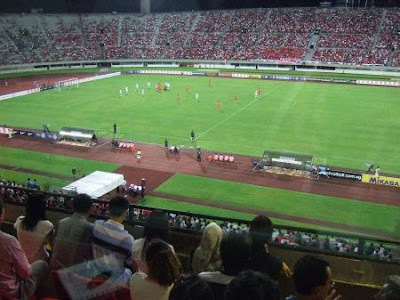 Looking forward to the Singapore Cup and seeing how far Bangkok Uni and Tobacco Monopoly progress. Just playing my part to raise the awareness of my domestic game.